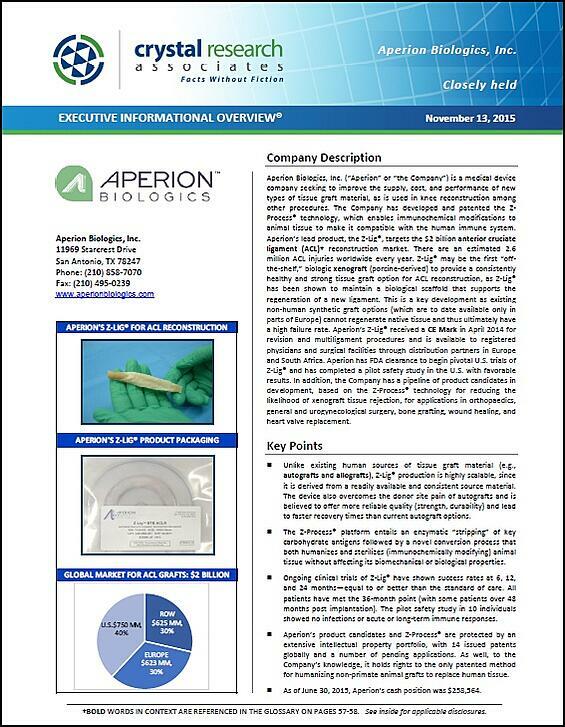 Aperion is a medical device company seeking to improve the supply, cost, and performance of new types of tissue graft material, as is used in knee reconstruction among other procedures. The Company has developed and patented the Z-Process® technology, which enables immunochemical modifications to animal tissue to make it compatible with the human immune system. Aperion’s lead product, the Z-Lig®, targets the $2 billion anterior cruciate ligament (ACL) reconstruction market. There are an estimated 2.6 million ACL injuries worldwide every year. Z-Lig® may be the first “off-the-shelf,” biologic xenograft (porcine-derived) to provide a consistently healthy and strong tissue graft option for ACL reconstruction, as Z-Lig® has been shown to maintain a biological scaffold that supports the regeneration of a new ligament. This is a key development as existing non-human synthetic graft options (which are to date available only in parts of Europe) cannot regenerate native tissue and thus ultimately have a high failure rate. Aperion’s Z-Lig® received a CE Mark in April 2014 for revision and multi-ligament procedures and is available to registered physicians and surgical facilities through distribution partners in Europe and South Africa. Aperion has FDA clearance to begin pivotal U.S. trials of Z-Lig® and has completed a pilot safety study in the U.S. with favorable results. In addition, the Company has a pipeline of product candidates in development, based on the Z-Process® technology for reducing the likelihood of xenograft tissue rejection, for applications in orthopaedics, general and urogynecological surgery, bone grafting, wound healing, and heart valve replacement. * The Corporate Snapshot was last updated on November 13, 2015.